This almanac was first published in The Bermudian in November 2002. 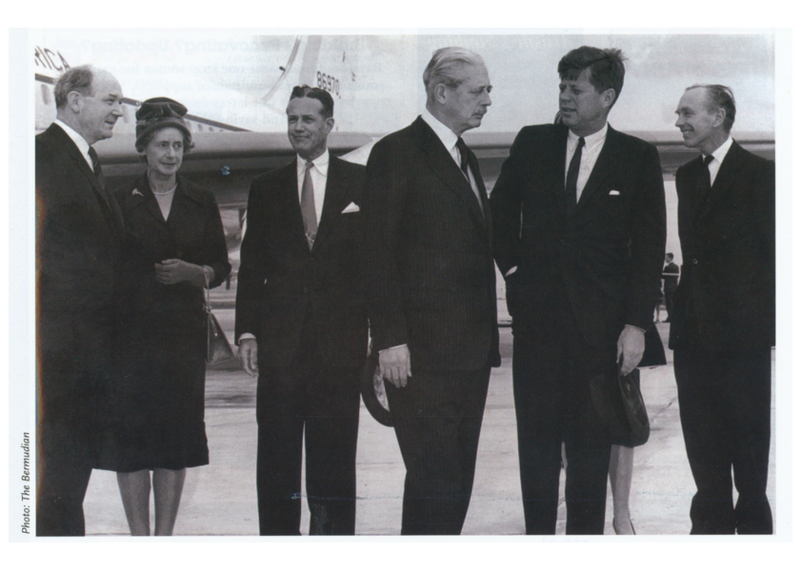 British Prime Minister Harold Macmillan greets U.S. President John F. Kennedy on his arrival in Bermuda for a two-day conference on December 21, 1961. On the agenda were the Berlin Wall, nuclear testing, the possibility of Britain’s entering the European Common Market, political unrest in Katanga, Goa, Laos and South Vietnam and the future of the United Nations. Also pictured are Dean Rusk, U.S. Secretary of State; Lady Gascoigine, wife of Bermuda Governor Sir Julian Gascoigine; George Renchard, U.S. Consul General; and the Earl of Home, British Foreign Secretary. November 26, 1849 marked the first time that a black person stood as a candidate in a Bermuda general election. The candidate was Augustus Swan, schoolmaster and owner of two houses and dry goods stores in Hamilton and Flatts. His election bid, however, was unsuccessful. Swan was a part of a coalition that had pledged black support for white candidates Samuel Nash, Ambrose Gosling and R. J. P. Darrell in exchange for white support for Swan. The strategy failed and all four candidates failed to win seats. A black person would not win a seat in Parliament until May, 1883 when William Henry Thomas Joell was elected in Pembroke.